Ukrainian corvette Ternopil, passing through Bosphorus. The Ukrainian, Grisha (Project 1124 EM/P) class corvette U-209 Ternopil passed through the Bosphorus today. She will take part in NATO anti terror operation in Mediterranean Operation Active Endeavour. The Ukrainian has deployed two warships at the same time for two different operations. The Krivak class frigate U-310 Hetman Sahaydachniy is in the Gulf of Aden to conduct anti-piracy operations while as mentioned U-209 Ternopil will take part in Operation Active Endeavour. The simultaneous deployment of two warships is a considerable feat for the Ukrainian Navy considering their size and resources. Today, October 8, antisubmarine corvettes Naval Forces of Ukraine “Ternopil” under Captain 3rd rank Oleg Grigoriev went from Sevastopol in the Mediterranean Sea to the tasks NATO antiterrorist operation “Active Endeavour”. While patrolling in a certain area of the Mediterranean Ukrainian crew of the ship will carry out practical steps to monitor civilian shipping, collecting and recording information on suspicious vehicles, their maintenance and inspection, maintenance vehicles with loads of special importance, antimine of civilian shipping. On board the “Ternopil” is an observation team of crew and unit of Marines. Commander of the Naval Forces of Ukraine Yuriy Admiral Il’yin when wiring the ship said that the corvette “Ternopil” their participation in Operation “Active Endeavour” is doing noble work for the Navy and the state. Head of the Armed Forces expressed confidence that the crew of honor perform all tasks. Personnel also read out greetings from the head region, which has patronage over the ship – Head of Ternopil Regional State Administration Valentine Hoptyana. The Governor wished the sailors swimming successful and happy return to home base. Since parting words to the crew and asked Assistant Secretary of Defense Ukraine stock Admiral Viktor Maksimov, Sebastopol City Council member Peter Kudryashov, Chairman of the Board of Veterans Ukraine Navy Rear Admiral Victor reserve Nosenko, director of “skeleton” Leonid Sobolev. Help. practical phase of NATO antiterrorist operation “Active Endeavour” in the Mediterranean began Oct. 6, 2001. According to the agreement between Ukraine and NATO on Ukraine’s participation in naval operations in the Mediterranean, the state supports the Alliance by bringing the operation of ships and inspection teams of the Naval Forces of Ukraine. The purpose of the operation – to prevent trafficking of weapons, drugs, preventing terrorism, human trafficking and the control of shipping. I am very much respecting all the efforts Ukrainian Navy is putting to maintain a submarine force. Given their limited resources and their dependence on foreign counties on some critical issues they could easily give up their silent service just like Bulgarians did, or the Danish. By giving up their silent service they could have saved important resources some of which might have been used to speed up the construction of their corvette. But no! The Ukrainians are determined to keep their silent service up and running even if it means using an almost obsolete 41-year-old submarine probably only limited to (or near) periscope depth. According to Ukrainian Defence Ministry the sole Ukrainian submarine the Foxtrot (project 641) class diesel-electric submarine Zaporizya returned to regular service. In Sevastopol held celebrations to mark the adoption of a large submarine “Zaporozhye” to combat fleet. Congratulate Submariner with a significant event came to head the Center for Naval Operations Navy captain 1 rank Andrei Tarasov, veterans-submariners, sailors and family members of chefs – representatives Vilnyanskiy district administration of Zaporozhye region. The celebrations began with the alignment of personnel and head to “Zaporozhye” Navy flag and flags roztsvichuvannya. The commander of a large submarine “Zaporozhye” Captain 2 rank Robert Shahyeyev said that last year the crew at the same time was very difficult and responsible, but by the number of successful assignments. – Last year, “Zaporozhye” took part in joint Ukrainian-Russian exercises “Fairway of Peace”, the sea trials out to sea and conducted a dive to periscope depth, and also participated in a joint celebration of Fleet of Ukraine and the Russian Navy Day in Sevastopol – said the commander of the submarine. At the end of the crew members of a large submarine “Zaporozhye” and present guests were photographed together in memory. Well, hats off to this remarkable success. 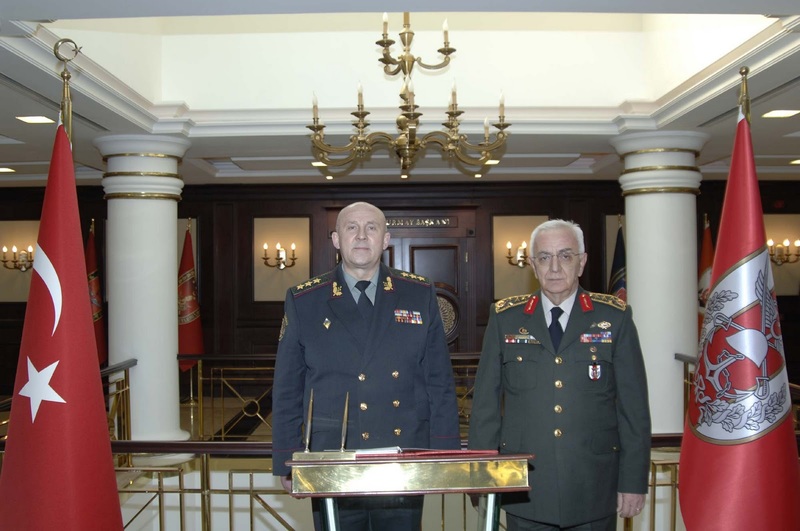 The Commander of Ukrainian Navy Vice-Admiral Yurii Ilyin Ivanovych visited Turkey as a guest of Admiral Murat Bilgel, Commander of Turkish Naval Forces. Neither Ukrainian nor Turkish Navy made any public announcements about this visit. Instead of the PR officers in both navies we should be thanking the marketing department of ADIK shipyard for the following photos and the text. As it is a marketing text it does not answer any serious questions like why Vice-Admiral Yurii Ilyin Ivanovych was in Turkey and about what did the two commanders talked about etc. Ukrainian Chief of Navy Vice Admiral Yurii Ivanovych Ilyin honored our Shipyard with his visit on November 17th 2012. Ukrainian Chief of Navy Vice Admiral Yurii Ivanovych Ilyin has been in a offical visit to Turkey as the special guest of Commander of Turkish Naval Forces Admiral Murat Bilgel. Ukrainian Chief of Navy Vice Admiral Yurii Ivanovych Ilyin has first visited AKSAZ Naval Base where he had the opportunity to visit in detail TCG Ç-151, the First of the Eight LCT (Landing Craft Tank) built by ANADOLU Shipyard during the years of 2009-2012 for the Turkish Navy Command. In the İstanbul part of his official visit, Ukrainian Chief of Navy Vice Admiral Yurii Ivanovych Ilyin first visited Pendik Navy Shipyard and then came to ANADOLU Shipyard, together with Turkish Vice Admiral Bülent Bostanoğlu, Commander of North Sea Region. Our CEO Ertuğ Yaşar and our Defense Group Coordinator Admiral (ret) Metin Poyrazlar presented to Vice Admiral Yurii Ivanovych Ilyin our shipbuilding capabilities as well as our Navy projects. Commander Vice Admiral Yurii Ivanovych Ilyin has shown an interest in LCTs built by our Shipyard for Turkish Navy and our Patrol Vessels design. Vice Admiral Yurii Ivanovych Ilyin and his delegation has asked technical and administrative questions about these two vessels, which were answered by both CEO Ertuğ Yaşar and Defense Group Coordinator Admiral (ret) Metin Poyrazlar. The Chairman of ANADOLU Shipyard, Mr. M.Faruk Ürkmez presented the models of our Shipyard’s LCT and LST designs to Vice Admiral Yurii Ivanovych Ilyin. The effort of the Ukrainian Navy and the resources they spend to put their only submarine Foxtrot class (Project 641) U-01 Zaporizya back to full operational status is amazing. I have tried to follow and report of these efforts since I have heard about it, in February 2010. After being left unused and unmaintained for a very long periods, the submarine was painstakingly and gradually restored to operational status with the help of Russian Navy. On 18th July 2012 U-01 Zaporizya made her first succesful dive and her underwater performance was tested. I think that the dive may have been limited to the periscope depth but nevertheless it was an important step in the restoration of the submarine back to the service. “The trial dive of the vessel has been successful. According to a special commission, the submarine is completely controllable, which is the most important thing,” the acting commander of the Ukrainian Navy, Vice Admiral Yuriy Ilyin said after the test dive in Sevastopol on Wednesday. “We do not doubt that the sea trials of the Zaporizhia submarine will be successful and the submarine will enter the fleet,” Ilyin said. I was slow to follow this event but it is important. Between 23 and 27 April 2012, the sole Ukrainian submarine Zaporizya conducted a series of test in the Black Sea. This is the first time that the 42 year old submarine sailed alone since 1992. The Foxtrot (Project 641) class Zaporizya is the only submarine in Ukrainian inventory. She her large scaled overhaul started in February 2010. The aim of Ukrainian Navy was to have her ready for duty by the end of May 2011. According to Jane’s Fighting Ships , Zaporizya has maximum speeds of 16 kt surfaced and 15 kt dived, with a range of 20,000 n miles at 8 kt surfaced and 380 n miles at 2 kt dived. Although the age and the condition of the submarine will restrict her operations below water considerably without any doubt this trials mark a very important step for the Ukrainian Navy as they have regained their submarine force back. I must say that I envy the courage of the crew of the boat. Today, April 27, after successfully conducted in the Black Sea the first phase of sea trials to return submarine Sevastopol Naval Forces of Ukraine “Kiev”. At 15.20 pryshvartuvalasya submarine to berth wall of the 13th shipyard Black Sea fleet. The crew of the submarine “Zaporizhia” personally met the Commander of Naval Forces Admiral Viktor Maksimov Ukraine. Chairman of the host committee captain 1st rank Roman sleek submarine commander Captain 2nd rank Robert Shaheyev commander reported the successful completion of the campaign. Commander of Naval Forces Admiral Viktor Maksimov Ukraine by telephone reported the Minister of Defense of Ukraine Dmytro Salamatin the successful completion of the first phase of sea trials and mooring berth at the factory. 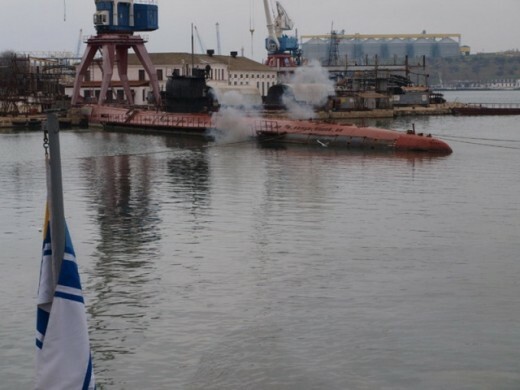 Head of the Ministry of Defence Dmitry Salamatin greeted the crew of the submarine “Zaporizhia” the successful performance of assigned tasks and return to Sevastopol. Ship for the first time since 1993 on April 25 went to sea with its own power plant. For three days the crew submarine was tested in a complex work of power plant at different running modes and performance equipment and technology.Members of the combat units together with experts sudnoremontnykamy-tested health equipment and various tools. In particular, in the electromechanical part of the battle were determined allowable load on the main diesel engine, with dimensions appropriate parameters at different frequencies of rotation of the crankshaft and the line shaft. Reliable feeding device horizontal and vertical steering wheels steering, tested hydraulic and air system pressure. In addition, by controlling the verification capacity of the battery when running motors at full power in the above-water position, and also tested other systems and mechanisms. During sea trials are carefully checked the reliability of communications, radar, search, sonar equipment and mate. Overall, during sea trials the boat was about 135 nautical miles in the above-water position. It should be stressed that the test took place in view of strict control in terms of security, the deployment of all necessary protective systems and equipment. The reactivation of the submarine creates a new dilemma for the Ukrainian Armed Forces. Keeping the 41 year old submarine with a very limited remaining service life, will be very difficult and expensive, draining valuable resources needed for other naval projects. On the other hand scrapping the sole submarine of the navy after so much public attention will not be a good political move. According to blog RusNavy Intelligence, Russian and Ukrainian navies conducted a submarine evacuation exercise together. Since Viktor Yanukovych’s election as Ukraine president, the cooperation between Russian and Ukrainian navies has grown considerably. Russia is actively helping Ukraine to maintain and renovate its only submarine U01 Zaporizya. The Foxtrot (Project 641) class Zaporizya is the only submarine in Ukrainian inventory. She is undergoing a large scaled overhaul since February 2010. The aim of Ukrainian Navy is to have her ready for duty by the end of this month. The timing of this exercise is interesting as it is coincident with the larger exercise of similar aim Bold Monarch, organised by NATO. The only Russian submarine in Black Sea Alrosa, is participating to NATO’s exercise off the coast of Spain. U-402 Konstantin Olshansky. NATO photo. Exactly at midnight of 23th March 2011, the Ukrainian Ropucha 1 class landing ship U-402 Konstantin Olshansky Sevastopol to conduct Non-Combatant Evacuation of Ukranian citizens trapped in Libya. She has passed through Bosphorus on 24 March 2011 early in the morning and left Turkish territorial waters late at night. According to Ukrainian Goverment Portal the ship can accommodated 500 to 600 evacuees on board. Large landing ship Konstantin Olshansky has all the necessary stores, including fuel and lubricants, and foodstuffs. To ensure the safety and security of citizens of Ukraine except the crew aboard the ship there is the unit of Marines with standard weapon, doctors from the Military Medical Clinical Centre of Crimean region and psychologists, interpreters with knowledge of Arabic. It was not stated on the portal how long the NEO will last. Ukraine is not the only Black Sea country that sends a warship to Libya. Both Bulgaria and Romania have announced that they each will send a frigate to participate NATO’s Operation Unified Protector. Romania decided to send the frigate F-221 Regele Ferdinand. The Type 22 class frigate was purchased from UK in 2004. The Romanian government decided to increase the defence budget by 4,5 million Euros from reserve funds in order to pay the participation of the frigate. Bulgaria, too will send a frigate to Libya. Bulgarian Defense Minister Anyu Angelov has issued orders to prepare the F-41 Drazki of the Bulgarian Navy for participation in the NATO naval operation of Libya’s coast. Both Regele Ferdinand and Drazki are currently in Black Sea and did not passed though Bosphorus yet. Official photo from Turkish General Staff. The Chief of the Armed Forces of Ukraine,Colonel-General Grigory Pedchenko is in Turkey for an official visit. 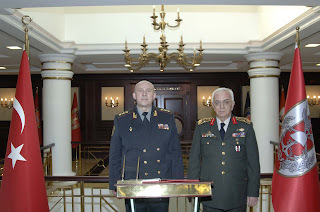 Yesterday Colonel-General Pedchenko visited hisTurkish counterpart General Işık Koşaner. According to the Ukrainian side the parties discussedkey issues and future prospects of cooperation between the armedforces of both countries. Special attention was paid to the development ofbilateral partnership in the framework of regional initiatives,including joint participation in the Black Sea naval groupcooperation “Blackseafor”, Operation Black Sea Harmony,confidence-building measures and security in the Black Sea. The sides also exchanged views on the development ofmilitary-political situation in the region and analyze its impact onthe Black Sea area security. While in Turkey, the Ukrainian military delegationwill to visit the operational center of operations of the TurkishArmed Forces of Turkey, 28th Mechanized Infantry Brigade, the Armyunit earmarked for peacekeeping operations, 4th Main air base inAnkara, Fleet Command of Naval Forces and and defence companyASELSAN. It is planned to harmonize existing cooperation ofthe training of troops participating in peacekeeping and antiterrorist exercises. 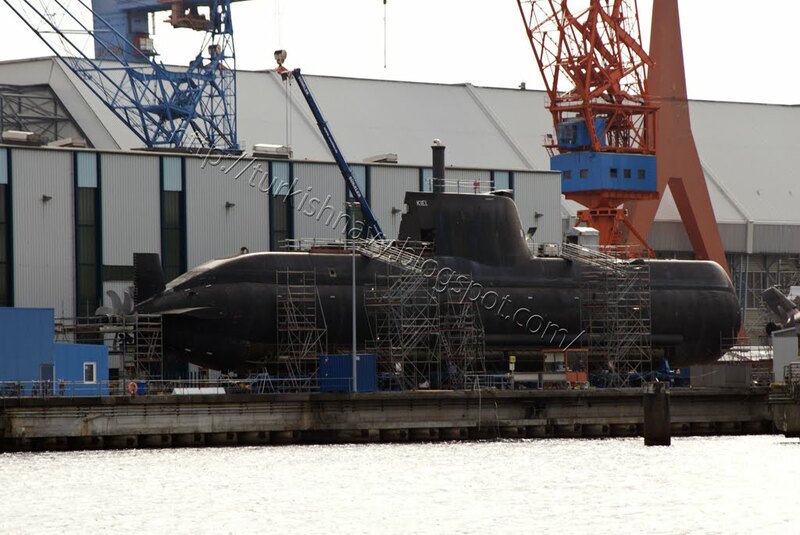 The work on Zaporizhzhya: Zaporizhzhya is Ukraine’s sole Foxtrot class (Project 641) submarine. She has entered into overhaul in February 2010. She is being overhoauled in 13th Repair Unit with Russian help. According to Ukrainian website e-Crimea, the diesel engines of the submarine were tested. Ukraine schedules to end static tests by 15 February 2011 and start sea trials. The submarine is expected to return to active duty after completing her sea trials in May 2011. Papanikolis in Kiel, a 2009 photo. For years Hellenic Navy refused to accept HS Papanikolis claiming the boat was not meeting the requirements. Poor performance from the AIP system, problems with the ISUS combat system, poor surface sea keeping in high seas, and hydraulic system issues were among the major flaws reported. And these flaws were mentioned again and again in printed in internet media to such extend that today it is very difficult (may be impossible) to convince the Greek people that theses flaws were remedied by the Germans. By the way, Papanikolis may be the most modern submarine in the region but she still lack an adequate punch. >When every important institution was some how effected by these cable it would be foolish to assume that Turkish Navy would be left out. According to one cable send by US Ambassador MR. Tafft from Kyiv the former Ukrainian President Mr. Kuchma thinks that the Russian Black Sea Fleet is not a match against the Turkish Navy. 8. (C) Kuchma downplayed the strategic importance of the Russian Black Sea Fleet (BSF), saying it could dispatch a ship to scare Georgia, but would be no match for the Turkish fleet. Since Ukraine must now pay the “world price” for gas, said Kuchma mischievously, Ukraine should insist that Russia pay the “world price” (i.e., “what the Americans have to pay for bases”) to homeport its BSF in Sevastopol. The question of Sevastopol is above all an emotional/nostalgia issue for Russians (“the city of Russian glory”), and they will never quit hoping to get it back. Kuchma said he once told Moscow Mayor Luzhkov that Ukraine would agree to return Sevastopol to Russia — provided the U.S. returned Alaska to Russia, and Russia returned the Kurile Islands. to Japan and Kaliningrad to Germany. Well this more or less a just a statement of the obvious. The Russian Black Sea Fleet as is inferior to Turkish Navy but combined with other Fleets Russian Navy is still a very worthy advisory that Turkey would not want to confront. Especially, when we are buying so much natural gas from them. But I was not able to find it among the other cables in cablesearch.org. So for me this is still unconfirmed.